Surf, No Turf — Summer is For Seafood! It’s the season for grilling, but according to the National Fisheries Institute, any season and every season is good for seafood, thanks to both advances in aquaculture (farmed fish) and cold storage capabilities. Since the national government is encouraging all of us to eat more seafood with its “MyPlate“ recommendation to choose seafood at least two times per week, those advances also make putting diet recommendations into practice more doable. Take “MyPlate” a step further with “The Healthy Eating Plate,” created by nutrition experts at Harvard School of Public Health and Harvard Medical School, which guides consumers to the healthiest choices in the major food groups. When it comes to proteins, fish is listed first, with good reason. Fish and seafood offer a wealth of nutrition. Shrimp – These little sea creatures offer great low-calorie lean protein that’s loaded with the powerful antioxidant astaxanthin, a red-orange carotenoid — like lutein and carotene — that also gives salmon its pink color and most likely contributes to the heart health benefits of both. Shrimp also contain a variety of minerals, particularly selenium, and even boast a fair amount of vitamin D, which is imperative for bone health and immune system function. Salmon – Most everyone knows salmon is one of the best sources of “good” omega-3 fatty acids, which are essential for human health, but our body cannot produce them all; therefore they must be consumed through your diet. These essential fatty acids support our cardiovascular and immune systems, neurological development, and overall functioning. Salmon are highest in DHA — one of three omega-3’s, and as with shrimp, salmon also gives us some great minerals and potent antioxidants from the natural rich red-orange color. Trout and Tilapia – These are two delicious, delicate white fish that also pack in lots of lean protein, vitamins, and minerals for few calories. Their mild flavor makes trout and tilapia an excellent choice for kids meals. Surf vs. Turf — Regardless of the seafood you choose, it wins out over red meat in the fat department. Seafood is the heart-healthy choice, as it offers more good fat but lower total fat versus red meat, which is the main source of unhealthy saturated fats in the American diet. If that’s not reason enough, swimsuit season gives all of us motivation to focus on healthier plates and to make seafood some of our go-to grill foods for summer. That’s an important point, because while summer and grilling are an obvious pairing, that doesn’t mean you should load up on burgers, steaks, hot dogs, and other meat. For better health and great flavors, make your summer sizzle with fresh seafood complemented with a combination of fruits, vegetables and herbs straight from the garden. 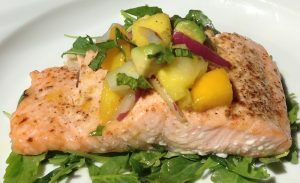 Here’s a summer challenge: make it a goal to eat seafood in place of red meat and processed meats several times a week in order to boost omega-3 fats in the diet and displace some “bad” saturated fats, as well as lower calories and cancer risks. At your next outdoor party, serve up seafood ceviche, vegetables, and hummus instead of cheese and crackers or chips and dip as appetizers. For the main event, grill a variety of seafood, including fish and shellfish in place of brats and burgers, and be sure to avoid burning it. For whatever reason you choose, making summer synonymous with seafood is easier than ever. If you’re not on vacation at the beach surrounded by fresh, local selections, you can still simply enjoy being “in vacation mode” at home and cooking great seafood from local supermarkets. Paired with summer’s fresh produce, you’ll find that going for the surf with no turf makes for some great summer grilling that’s bursting with nutrition and flavor. The great thing about being invited to join a virtual potluck is that you can be fashionably late and the food won’t get cold. Despite being a bit “delayed”, I’m thrilled to be a part of this and introduce you — I mean ya’ll — to Tasia’s Table. I’ll try to make a long story short, or at least shorter than what’s typical for me. As fate would have it, more than 4 years ago my dear friend and neighbor Stephanie sadly moved from NJ to AL . The story couldn’t be farther from sad, however. Once she survived the initial culture shock, Stephanie embraced her “new life” with the help of her new neighbor and fast friend who happened to be a really amazing woman and entrepreneur named Tasia Malakasis. Missing my old friend a lot, I made several trips down to Stephanie’s new home and met this super cool celebrity cheese-making friend I had heard so much about. Voila! I now had two friends in Alabama! During that first trip (or so my memory tells me) we talked about Tasia writing a cookbook, and I wanted to be involved. Actually I had always wanted to write my own too. So what really happened was that she both motivated and inspired me to do it for myself. … Here we are 4 years later, and both Tasia and I released our first cookbooks this year! Woo hoo!!! What’s even cooler is that the Stephanie I knew in NJ had her own darkroom in the basement of her very old, historic home when I met her, and photography was “just” her hobby. Well…the move to AL brought out the food photographer in her, and I couldn’t be happier for her or more impressed by the beautiful work she did for Tasia’s Table. Maybe I should pour a little bourbon and skype with Stephanie to gush more, but I’m late for that potluck, remember? Ok, fast forward to me opening the email about the book release and virtual potluck with instructions to pick which recipe I’d like to make, there was almost no question! Greens pie, baby! 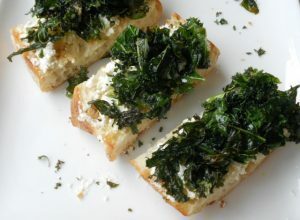 … and thinking about how I’d like to be making the the greens pie recipe, the thought of the greens and goat cheese triggered what I’m calling Tasia’s Greens Pie turns Greens ‘n’ Goat Cheese Toasts in 3 Simple Steps. I happened to have the three simple ingredients required on hand the other day, and I’m thankful I did. It’s my new favorite lunch, dinner and/or appetizer. 1. Preheat oven to 400 degrees. Put kale in a large bowl. Drizzle with about 2 or 3 Tbsp olive oil. 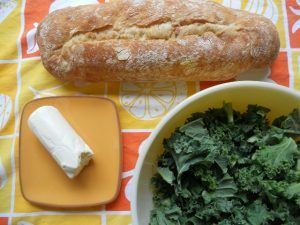 Toss evenly coat kale, then turn onto a baking sheet. Sprinkle with sea salt. Put in oven to roast for 10 minutes. 2. Slice ciabatta in half lengthwise, then cut into smaller pieces or leave as two long pieces. Spray grill pan or electric skillet with olive oil cooking spray and grill or toast bread on the cut side until golden brown. Note: Leftovers can be wrapped and refrigerated for several hours or a day. Reheat in oven at 400 degrees for 4 or 5 minutes. I’m hoping to still get to the greens pie someday… but in the meantime I’ve already picked out a few recipes from the book that I must do, and the first is Fennel Goat Cheese Mash. Oh! So excited for this one, and I’m serving it alongside a simple grilled steak with Tasia’s “compound butter.” Now if that tempts you, then be the first to tell me and you’ll win a free signed copy of Tasia’s Table. Simply email me at: susan@susangreeley.com or tweet me @SusanCGreeley #TasiasTable. 3. Virtual potlucks. I’m thankful to be a part of this, Tasia! but there’s good reason it should — October is National Seafood Month! Hot or cold outside, seafood is in. Help with healthy brain development of infants and children. Maintaining good heart and cardiovascular health — The cholesterol question was answered more than a decade ago, and it appears that not only fish but shellfish, such as shrimp, improves heart health. Weight control — The combination of lean protein with a lack of saturated and trans fats but containing good fat is to credit for helping with weight control. Anti-aging — Omega-3’s and antioxidants are at play to prevent memory loss as we age. There is also reason to believe seafood helps us look younger longer and that fish oils and antioxidants may even prevent muscle damage and loss associated with aging. Scientific studies have attributed most of these health benefits to the “good” omega-3 fats found in seafood, but it goes beyond that. Seafood offers a variety of vitamins and minerals, including selenium, which is one mineral that acts as an antioxidant, helping the body rid itself of damaging free radicals that can age our cells and cause disease, including cancer and heart disease. As for the best anti-aging, anti-inflammatory and anti-cancer seafood, shrimp and salmon are the best choice. The pink color in both comes from a compound called astaxanthin, a carotenoid phytochemical (plant nutrient) and antioxidant known for its powerful free radical scavenging effects. Shrimp and salmon get this plant nutrient from eating specific algae that naturally contain it. The benefits are passed to the shrimp and salmon and other seafood that eat the specific pink or red algae, much the same way that salmon get their omega-3 fatty acids from eating krill. In other words, seafood can help you look and feel great. The 2010 Dietary Guidelines for Americans calls for Americans to eat at least two servings of seafood per week and for the general population to increase amount and variety of seafood consumed. This means now is the perfect time to add seafood to your weekly meals repertoire and party menus. As for socializing this fall, from tailgating and game nights to Halloween and Thanksgiving get togethers, think seafood. For small or large groups at home, cook up a savory seafood cioppino (seafood stew) or simply set out some shrimp cocktail. If you’re heading to an outdoor tailgate party, pack up some “peel & eat” seasoned shrimp or grilled shrimp with dipping sauce. For daily meals as well as special occasions, there is great variety of fresh seafood to be found in supermarkets everywhere. The fresh seafood offerings have expanded nationwide due to improved farming methods (responsible aquaculture) creating abundant, healthy and sustainable supplies of fresh seafood. For nutritional comparisons, more information can be found on the National Fisheries Institute website at www. aboutseafood.com. If you’re looking for a simple, healthy everyday recipe, here’s a quick and colorful (= vitamin-rich) way to enjoy shrimp any time of year. Enjoy Susan’s quick and delicious shrimp recipe any time of year. 1. Bring water to a boil in a small pan. Add quinoa, reduce heat to low and simmer covered for 15 minutes. 2. 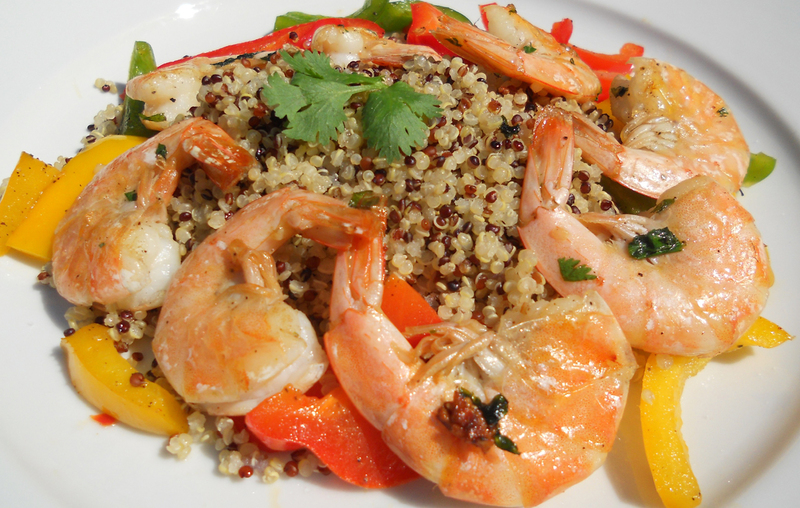 While quinoa cooks, toss shrimp with 2 Tbsp. olive oil, garlic, and cilantro in a bowl. 3. Heat remaining 1 Tbsp. oil in a grill pan over medium heat. Add bell peppers and a pinch of salt. Let cook for 4-5 minutes, until tender but still crunchy. 4. Transfer peppers to a bowl or plate and return pan to the heat. Add shrimp, a pinch of salt, and cook over medium-high heat for 2-3 minutes, turning to cook on both sides and until slightly browned and no longer translucent. 5. Spoon quinoa onto serving plate. Top with peppers and about 8 shrimp per person (5-6 for jumbo shrimp). 6. Add several avocado slices to the plate. Drizzle quinoa and shrimp with olive and a sprinkle of remaining salt. As the kids head back to school, many moms (and dads) hit the books too — cookbooks, that is! Back to school means back to the kitchen. Good nutrition habits may have gone on vacation with the family this summer, but when it’s time to get back into a routine, parents look for ways to get nutritious meals on the plate every day. 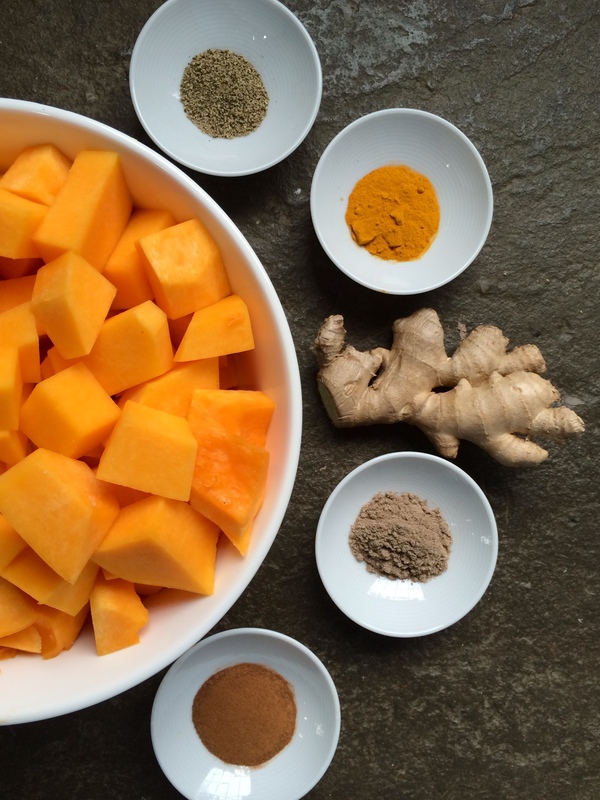 Moms in particular start thinking about making meals that keep kids focused and fight the flu. Eating fish can help with both! It is a good source of omega-3 fatty acids, which are vital in brain development of infants and young children and also support a healthy immune system. These good fatty acids may even help children who deal with anxiety and attention issues, and the lean protein and minerals found in fish are needed for young growing bodies. There’s knowing and then there’s doing. Parents can tell their children that the fish on their plate is good for them or may even help make them the smartest kid in class, but how do you get them to actually eat and enjoy this brain food? The following tips may help make meal time more pleasant by making fish a family favorite. 1. Keep it simple. Most kids don’t want fancy or gourmet or UFO’s (unidentified food objects) when it comes to dinner time. If they can’t identify what they’re eating, they often turn up their noses. 2. Make it crispy or crunchy. There’s a reason breaded and fried foods, such as fish sticks and nuggets, are kid pleasers. They offer texture and flavor that kids like, and there’s nothing unhealthy about making fish this way at home. 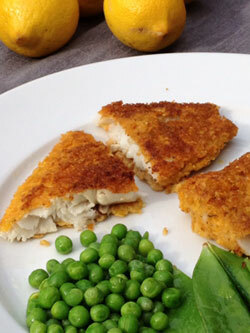 Breadcrumbs, cereal, and even potato chips can be used to make a tasty, crispy fish enjoyed by the entire family. 3. Fun food tastes better. Okay, maybe not, but kids are more likely to eat it if you give a dish a silly name, so why not try it?! For a favorite back-to-school dinner that can teach basic shapes to young ones or simply amuse your older geometry student, try my easy recipe for a cornflake-encrusted pan-fried tilapia that guarantees clean plates. As a nutrition side note that parents will feel good about, you can get as much as 160 mg omega-3’s per 3-ounce serving of tilapia. This is my gluten-free, lower calorie version of huevos rancheros, which typically has fried eggs over refried beans and then topped with cheese and salsa. For meat eaters, add a couple strips of nitrate-free bacon, as I do in my cookbook. To make it vegetarian, this version adds an egg and avocado and removes the bacon. Either way, enjoy your huevos and whole grains for breakfast or brunch before you head out to party on Cinco de Mayo! 1. Microwave brown rice according to directions (3 minutes) and place 1 cup on plate. 2. Spray frying pan with cooking spray. Over medium heat fry eggs until yolk is firm. 3. 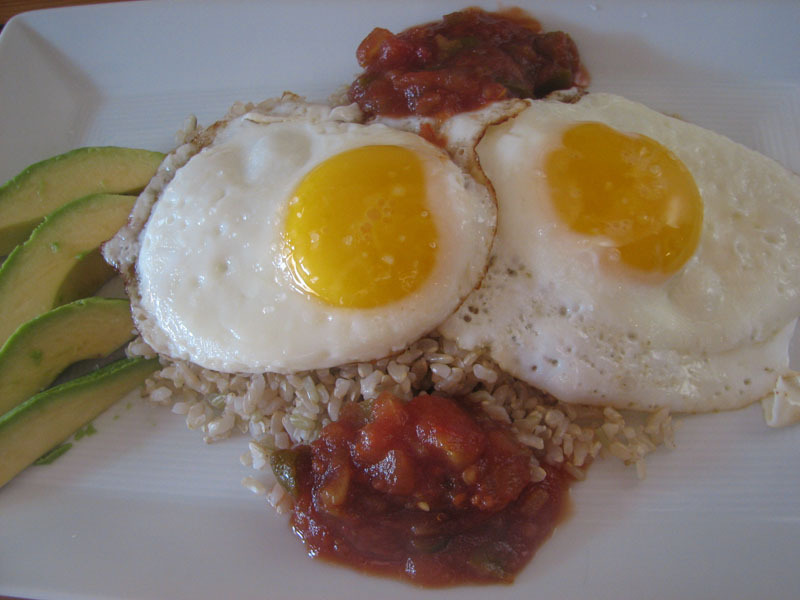 Place eggs on rice and top with salsa. Add dash of salt and pepper if desired. Serve with avocado slices on the side. This doesn’t involve tequila, but it is a delicious way to “get loaded” on Cinco de Mayo! Toss these few ingredients together for a winning weight loss salad that’s loaded with vitamins, fiber, phytochemicals, a little good fat, and great flavors. It’s such a simple salad to assemble in minutes — great for lunch or as a side dish. 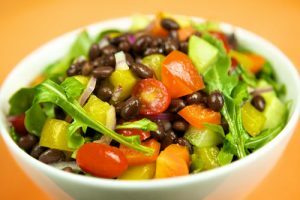 1 Combine beans, arugula and vegetables in a bowl. 2 Sprinkle with salt and garlic powder. 3 Drizzle with oil and vinegar and toss well before serving.